The 1978 Trans Am series had two classes - Category I and II. Many of the cars in Category I were from the SCCA amateur ranks. Most of these cars started life as production vehicles that were modified for racing. The Category II cars were purpose-built for competition. The class was for FIA Group 4 and 5 cars. Category II rules were quite liberal allowing builders to create tube frame chassis cars and almost any modification was allowed as long as the vehicle retained the original block and heads. The championship consisted of ten events - all being one-hour in length. The exception was a six-hour race at Watkins Glen which offered double points. 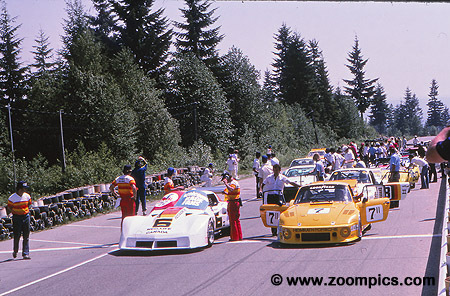 The series started in May at Sears Point and for the first time in Trans Am history, an event would take place beyond the North American borders of Canada and the US. Mexico's Ricardo Rodriguez Autodrome would host the series final round in November. Westwood was the second event of the 1978 season. To increase the excitement of this event, two 5-lap sprint races were added to Saturday’s schedule with prize money added to motivate the drivers. Unfortunately, these races only contributed to the confusion of the qualifying process. Two one-hour qualifying sessions set the grid for the sprint races. The results of the 5-lap races had no bearing on the starting positions for the feature. But a driver could improve their starting position in Sunday’s race if they turned a quicker lap than they had recorded in the first two one-hour qualifying sessions. The attrition rate was high in these races but eight drivers improved their times. The front row consisted of Greg Pickett on the pole in a Category II Chevrolet Corvette. 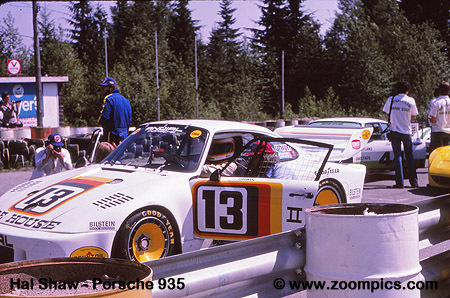 Qualifying second was 1977 Trans Am champion Ludwig Heimrath in a Porsche 935. 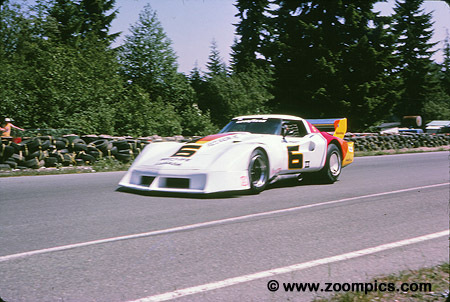 Behind Pickett and Heimrath are third fastest qualifier Tuck Thomas in a Chevrolet Monza and Hal Shaw in a Porsche 935. Ludwig Heimrath was all smiles before the start and he had even more reason to smile at the end or 56-laps. 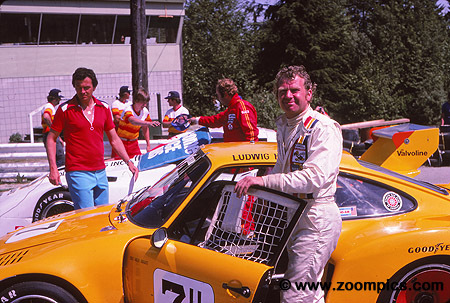 He took the overall and Category II win finishing a lap ahead of the Porsche 935 driven by Hal Shaw. Heimrath would capture a second win in the 1978 season at the final round at Mexico. However, he would not repeat as series champion finishing third in the final standings. Greg Pickett won the opening round of the 1978 Trans Am series at Sears Point. At Westwood, he qualified at a 1:05.14-seconds which was just over 3-seconds quicker than Ludwig Heimrath. At the start, Pickett opened a big lead but transmission problems slowed his progress and he would finish fifth overall and third in Category II. 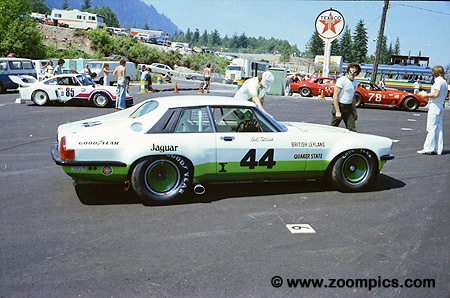 Bob Tullius driving the Group 44 prepared Jaguar XJS qualified fastest in Category I. He led the opening laps followed closely by Nick Engels in Chevrolet Corvette. On the seventeenth lap, the Jaguar's brakes were overheating and Tullius decided to let Engels pass. Engels would lead the remainder of the race and take the Category I win while Tullius finished second. Greg Pickett in the red driver's suit and Bob Tullius chat before the start. 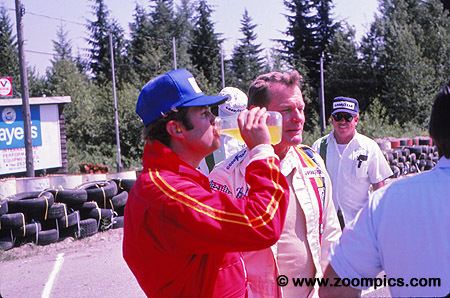 In addition to his win at Sears Point Pickett would go on to take victories at Mosport, Road America and Laguna Seca. He would finish 18-points in front of Tuck Thomas to capture the 1978 Category II championship. Tullius would take the 1978 Category I title. 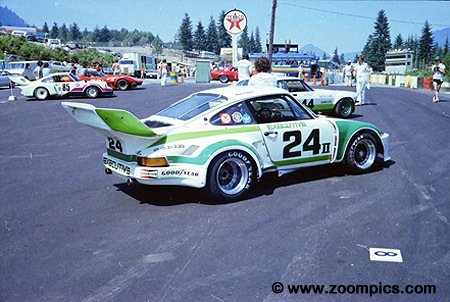 This Porsche Carrera RSR was driven by Tom Frank. Frank finished second overall and in Category II in the series opener at Sears Point. At Westwood he did not have the same results - clutch problems forced him to retire after only 19-laps.